The humid Shanghai air crackled with anticipation as hordes of sweating football fans burst out of the subway. The giant Hongkou Stadium loomed above the exit, scaffolding still in place following the recent fire that forced its closure for six weeks. On the ground, touts scurried around waving handfuls of tickets, some selling for up to 20 times face value. This was a match not to be missed. 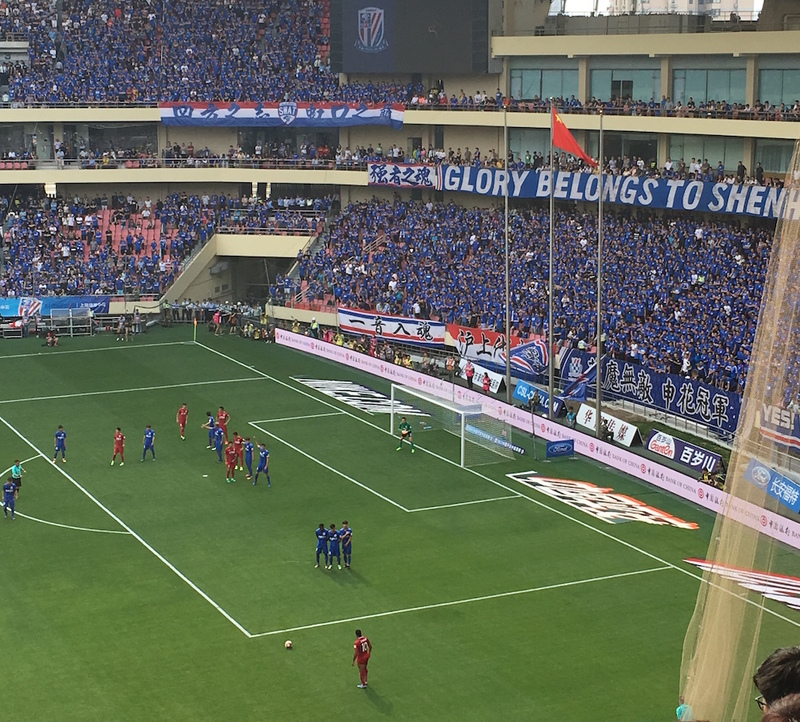 For Shanghai Greenland Shenhua, the city’s oldest club and hosts in this derby, it was a chance to briefly forget their struggles under new manager Gus Poyet. A win over bitter rivals SIPG could be the turning point in an ailing season. Elsewhere in this buzzing metropolis, the most populous city in the world home to some 24 million people, it was almost impossible to tell there was a game taking place. 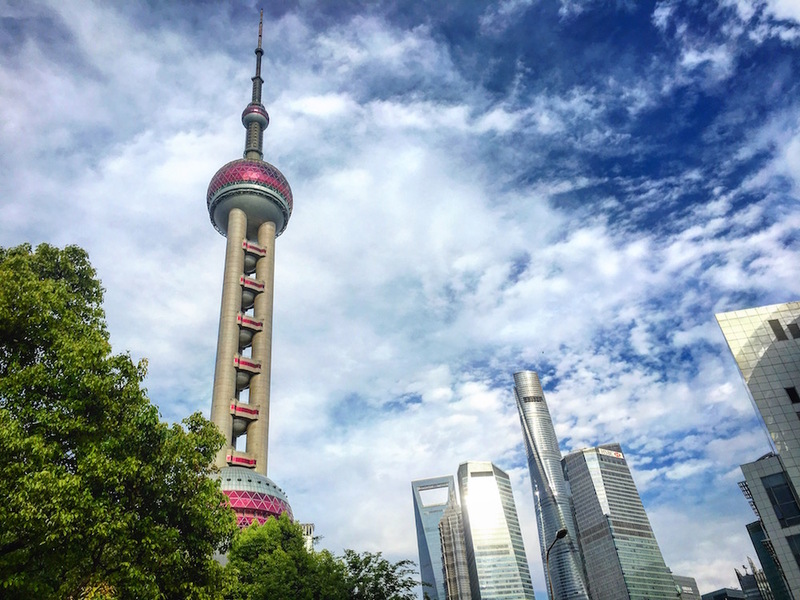 For most it was a typical lazy Saturday afternoon, sheltering from the heat in enormous air-conditioned malls, ambling along the Bund in the shadow of Pudong’s towering skyscrapers, or walking yappy brown poodles along the city’s leafy streets. Occasionally you could spot a flash of blue – the kiosk attendant at Jing’an Temple station, the teenagers rushing for the train at People’s Square – but it was only when we squeezed together like sardines on the line out to Hongkou in the north that the atmosphere began to bubble. Shenhua’s task was made all the more difficult by Carlos Tevez’s absence through injury. A Premier League title winner with Manchester United and Manchester City, the Argentine is yet to adapt to life in China since moving from boyhood club Boca Juniors at the turn of the year. He has managed only four appearances so far, scoring once, and was criticised for taking a trip to Disneyland during Shenhua’s win against Changchun Yatai in April – another match he missed through injury. His loss was still felt keenly by some, however, with one supporter acknowledging that, even at 33, if Tevez can stay fit he will be a menace to any defence in this league. “I think SIPG will win today,” the Shenhua fan told me with a sigh. The other Super League team from Shanghai are managed by Andre Villas-Boas and feature Oscar and Hulk in their first XI. They have made a strong start to the domestic campaign and have reached the knockout stages of the Asian Champions League, a competition Shenhua failed to qualify for after losing to Australian outfit Brisbane Roar in the preliminary rounds. SIPG were favourites to triumph on Saturday, although an allocation of around 500 tickets meant that most of their following wouldn’t be there to enjoy it. The club was founded in 2005, more than a decade after Shenhua turned professional, and started out as Shanghai East Asia before recent investment from the Shanghai International Port Group. That huge windfall has seen SIPG establish themselves as the greatest threat to Guangzhou Evergrande’s dominance in Chinese football and provided the funds for Oscar’s record-breaking £60 million move from Chelsea. It has also stoked Shenhua’s resentment, with the simmering hostility of this nascent rivalry further encouraged by the horrific leg break suffered by Demba Ba in this fixture last season. Ba’s name still adorned the backs of many of the shirts that formed a sea of blue inside Hongkou Stadium. The former Chelsea striker was in blistering form before his injury but has since returned to Besiktas on loan. Other familiar faces at Shenhua include Obafemi Martins, once of Newcastle, and Fredy Guarin, who joined from Inter Milan nearly 18 months ago. Sporting a bright mohawk in Shenhua’s colours, it was Guarin who dictated the early stages of the derby. First he tried to lob SIPG goalkeeper Yan Junling from 50 yards, and moments later he fired wide from a tight angle. It was a feisty opening period, the hosts snapping into tackles and forcing SIPG defender Zhang Huachen to limp off in the first ten minutes. The 19-year-old’s withdrawal may already have been planned – at the beginning of the season the Super League introduced a new regulation that each starting line-up must include one Under-23 player, but several coaches have undermined the directive by making first-half changes. 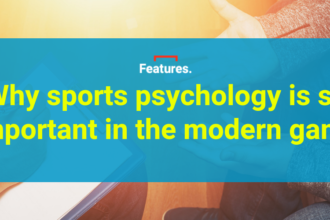 There were many aspects to the occasion that were familiar, despite the Super League’s relatively recent arrival in football’s collective consciousness. The sight of Villas-Boas attentively prowling the touchline was reminiscent of his days at White Hart Lane, here wearing fetching neon pink trainers, while in a similar vein Sunderland fans could relate to Poyet gesturing frantically at the officials, aggrieved by a decision. 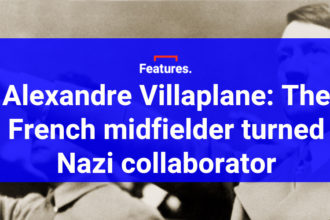 Hulk too was on autoplay, either cutting in from the flank and lashing at the ball with his left foot or rolling around on the pristine turf. I counted three plays for Ed Sheeran’s latest pop hit, which there is clearly no escaping. The only details that seemed incongruous were the banners in Pro Evo English – “Yes! We are the best forever No.1!”, “All for champions! Never stop!” – and 5’7” striker Martins defending a corner by heading the ball clear at the near post. Half-and-half scarves were also conspicuous by their absence. 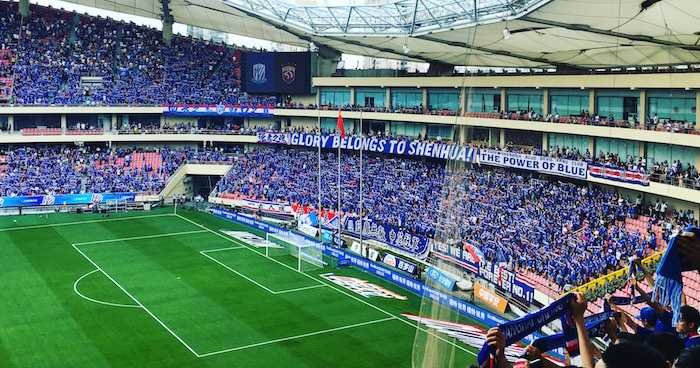 Every Shenhua fan wore blue to display their loyalty, often club merchandise along with the odd Chelsea shirt, while the SIPG cohort in the top corner of the main stand, who had been shuttled in to avoid potential skirmishes, were all dressed in red. At least until the closing minutes, that is, when many imitated Hulk’s celebration of his match-winning goal by ripping off their shirts to reveal slightly less bulky torsos. The Shenhua fans remained behind their team despite SIPG scoring two late goals to win 3-1, the home side’s misery compounded by defender Li Yunqiu’s own goal. It would not have been unusual to hear jeering at the final whistle in England, but in Hongkou Stadium the only boos were reserved for the opposition. 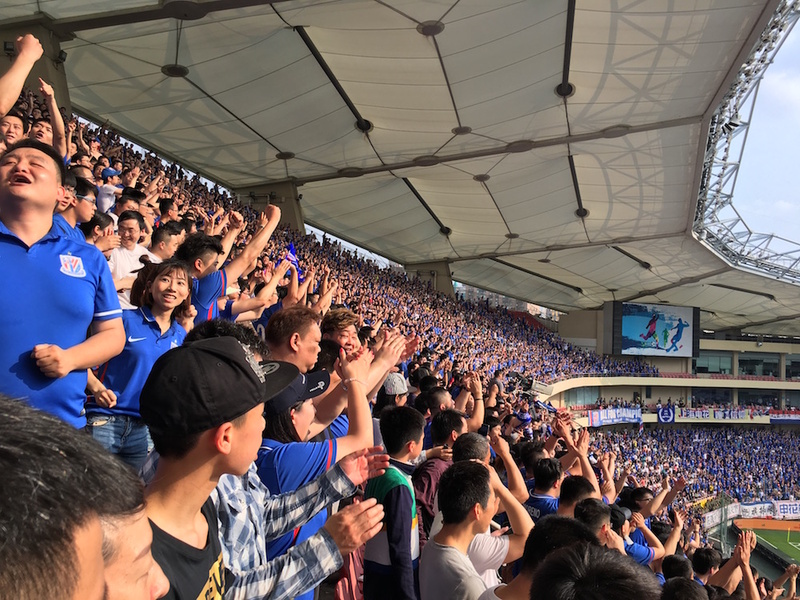 A significant security presence and segregation prevented the opportunity for trouble between rival supporters, although there was a scuffle in the stands at the final whistle when an SIPG fan in the Shenhua section foolishly revealed his allegiance. While most of the Super League coverage has focused on multi-million pound transfers and wages, this derby provided proof that China’s football culture runs much deeper than the headlines. The passion was genuine, and there were several generations of supporters in attendance, men and women, boys and girls. With skilful national team winger Lu Wei scoring SIPG’s first goal in a victory to savour, there was also a nod to the country’s plan to develop their own talent to complement the foreign stars whose profiles they are currently leveraging to make a play on the game’s global stage. The plan is to win the World Cup by 2050 and host it much earlier than that. Next articleHenry Onyekuru Profile: From the Aspire Academy to Arsenal?